Reza, the world-famous illusionist, returns to Branson for a limited time only. Watch as Reza performs the impossible right before your eyes. Audiences are mesmerized as Reza makes a real-life helicopter appear out of thin air, performs fire stunts, and grand scale illusions. You never know what will appear, or disappear, next! The show features fire, strobe lights, and other stage/lighting effects. Ideal for older children and up. Performed at the Branson Famous Theatre. BRANSON'S ONLY TOP 10 ILLUSIONIST! Reza "Edge of Illusion," is a fresh, ground-breaking spectacle merging signature grand scale illusions (like the split-second appearance of a real helicopter) with incredible interactive magic. 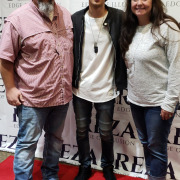 Hailed by critics as of the world's top illusionists, Reza has sold out venues across North America as well as astounding over 30 million viewers from across the World on popular reality shows including the current seasons of A&E's Duck Dynasty, CW's Penn and Teller : Fool Us, and Japan's Wonders of the World. In addition to his Branson residency, Reza has also headlined such notable venues as: the Alamodome (San Antonio), the Fairmont South Hampton (Bermuda), Philips Arena (Atlanta), Villanova Pavilion (Philadelphia), Rama Arena (Toronto) and Mundo Imperial Forum (Acapulco), to name a few. Don't miss the opportunity to see Reza live in Branson! No. For the safety of the performers and audience, flash photography and videography is strictly prohibited during the performance. Is food served at the show? No. This is not a dinner show. The Branson Famous Theatre is located at 645 MO-165, Branson, MO 65616. Yes. Ample self-parking spots are offered onsite. Yes. However, parents should be warned that Reza does use power tools, fire, and other large-scale objects during his performance that may frighten younger children.